Charming 3 parts 40m between St-Ouen Flea and the Champs Elysees. Charming 3 room apartment of 40 sqm in the heart of the 18th, 2 steps of Saint-Ouen flea market, Montmartre, Pigalle, the department stores and the Champs Elysees. 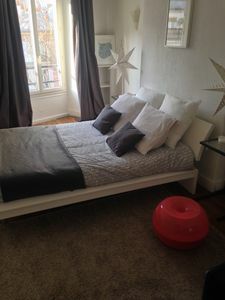 In a typical district of Paris with all traders and Metro in front of the apartment. Renovated in January 2016, we wanted our guests feel at home. Very well equipped. It consists of a large room with 1 double bed and a small bedroom of 9m with an extra bed (BZ 140cm), a shower, a toilet, a living room and a kitchen. It is bright and very pleasant, very functional and quiet. It is the 4th floor. We can install a cot if you wish and you pay cane stroller. The kitchen is fully equipped (electric hob., Microwave, Nespresso coffee machine, fridge freezer ...). The beds are 140x190 and duvets (240x220cm) and pillows. exit cleaning fee is 50 €, costs include rental of sheets and towels. An optional cleaning and linen change, during your stay can be requested for an additional 25 €. our check in and check out times are flexible providing there are no rental after you.